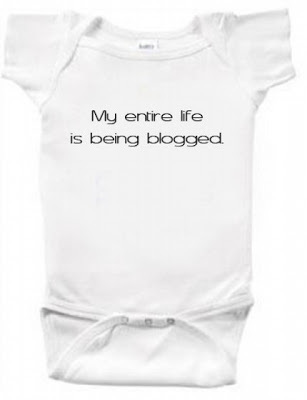 I found this funny Onesie on Etsy by Rainbow Swirlz Kids. I think I should get my little guy one. Oh that is hilarious! Suzanne needs one too. I think I might want one myself with my new found addiction. (meaning the baby and the blog) Hey have you ever posted pictures of your baby’s nursery? I would love to see it I bet it is so cute! OH I have got to get that for Emma! That is so funny. I will have to pass that along too! !